Personally, I believe God gave us food to bless us and to, well, indulge and even entertain us! That’s why I find our discrete cultural attitudes about food devastatingly intriguing. The phenomonon that we feel guilt over even small food slip-ups and expereince self-loathing when seeking satisfaction from food is quite paradoxical to me. It's also directly contrary to my belief about this body-nourishing blessing meant to indulge and entertain us. Think about it: Would God have gone to the trouble of all the creating such a vast variety of tastes, textures, colors and combinations had He not intended us to enjoy eating while nourishing these beautiful bodies He created? After all, He could have simply created one super-pellet we’d consume to satisfy all our nutritional needs. But He didn’t. He went all out to make food fun and enticing to eat! Biblically, since the beginning of time, celebrations included special foods to feast on to enhance one’s experience. Families of believers broke bread as they communed around the table to honor God and express gratitude. Food was often given as gifts or offered as sacrafice. That means food is a GOOD thing, right? Still today, food enhances festivities and, when shared, communicates care for others. God gave us such goodness when He dreamed up the way we'd sustain our earthly existence! Problem is, our human nature attaches all kinds of mixed-up emotions, triggers, destructive thoughts and unhealthy habits to foods we consume. Not to mention the number the food industry has done to contaminate our crops, preserve and process foods making many almost completely non-nutritive. Food has evolved from God's good intentions to a source of emotional and physical harm. I can’t imagine God intended His gift of human nourishment to harm us! Between personal problems and the industrialization of food, we fight an uphill battle to receive the blessings meant for us in a meal. I’d argue it’s not only the crops that are contaminated—it’s also our messed-up mindsets when it comes to eating and our relationship with food. It’s like a marriage ordained by God gone wrong in the ways of the world. ly moist cake to show you how it can be done. 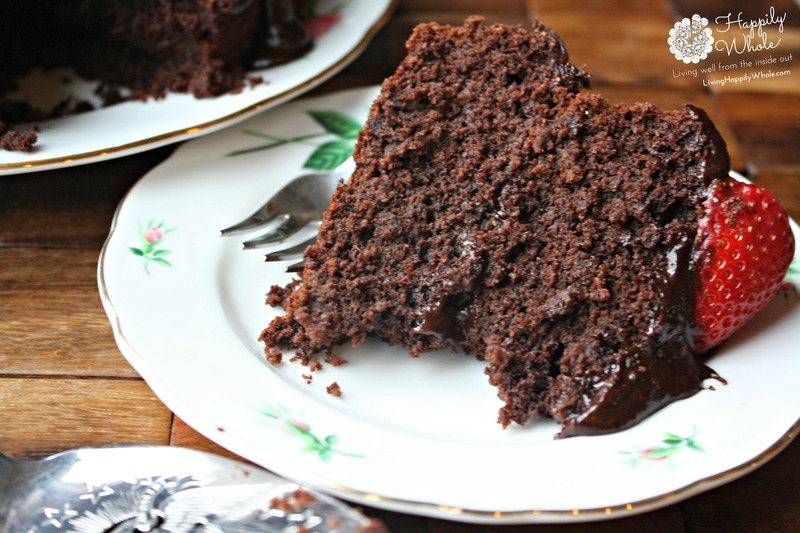 Check out the ingredients to this grain-free chocolate cake. Even better, sit down with a piece and be entertained by the blessing! Here's how, in 3 simple steps, I've learned to take back the blessing of food in my life: 3 Simple Steps, and I bet they are not really what you think! 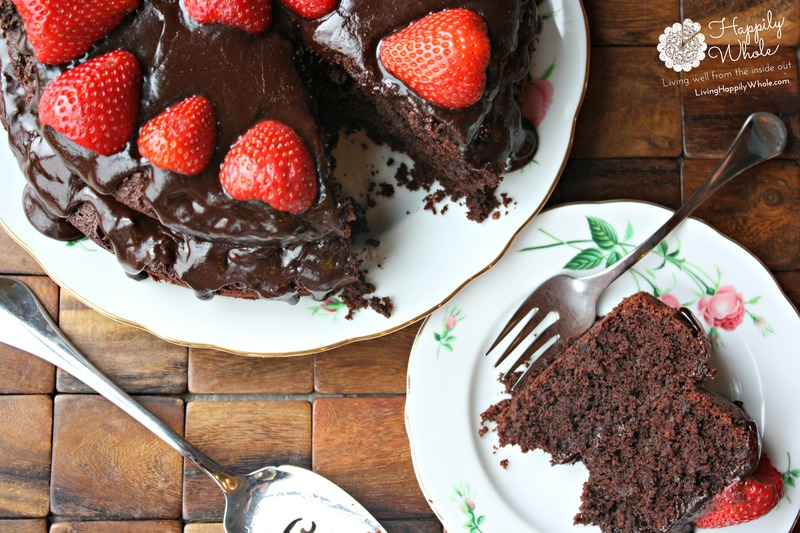 This one is for your sweet tooth from my chocolate-loving heart! A small slice will go a long way. Preheat oven to 350 ºF and adjust rack to middle position. Place the chocolate and butter in the bowl of a double boiler. Melt, stirring occasionally. Set aside to cool (important: the mixture needs to cool for at least 10 minutes before adding the egg mixture below). Place the maple syrup and eggs in the bowl of a standing mixer with whisk attachment. Whisk for 5-6 minutes until pale yellow and billowy. Slowly whisk in cooled chocolate and vanilla extract. Sift almond flour, coconut flour, cocoa powder, baking soda and baking powder over egg mixture. Gently fold to incorporate. Divide batter between two buttered 9 inch cake pans (I prefer to line my cake pans with a round piece of unbleached parchment paper to ensure the cake will come out properly). Bake cakes for 20 minutes or until a cake tester inserted in the middle of the cake comes out clean or with a few moist crumbs. Cool cakes for 10 minutes, run a knife around the edges and then remove the cakes from the pans. Cool completely. To make the frosting, put the coconut milk, sugar, and butter into a small sauce pan. Heat over a low to medium heat until bubbling. Stir until sugar is dissolved. Add the chocolate and vanilla extract and turn off the heat. Stir until the frosting thickens enough to put on the cake without it running all over. To assemble: Place one cake layer on a cake stand or plate and top with one third of the frosting. Spread frosting evenly on the cake. Place second cake layer on top and use remaining frosting to frost the top and sides of the cake. See photo. Let the thickened glaze drizzle over the sides. Optional: Garnish with strawberries or any other fruit of your choice. *For the 8 ounces of dark chocolate, I have used both Enjoy Life brand chocolate chips and 72% organic dark chocolate bars chopped. ***When you open the coconut milk can, the top will be more of a solid cream with liquid underneath. Whisk together as best you can, then measure out your ⅓ cup for the frosting.